We’re all secretly looking for that special venue to blow all other weddings out of the water – and Weddings at QMUL might just be ‘the one’. With irresistible historic charm and stunning 360-photo opportunities, this is a venue not to be missed (especially if you have that fairytale happily ever after in mind). Walking up to the grand exterior of the iconic Queen’s building, prepare yourself as you enter this unforgettable venue. You will be captivated by the decadence of the Grade II listed building as you proceed to tie the knot in the white-walled, Senior Common Room which overlooks the grand Victorian Clocktower and the Queens’ Lawn. 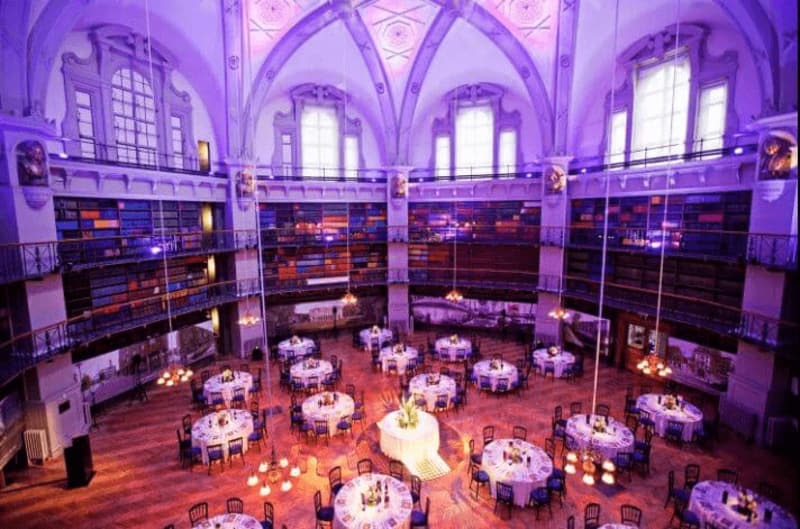 Your special day continues as you head to the gorgeous Octagon, where dramatic domed ceilings and multi-coloured literature-lined shelves dominate the space. You and your beloved guests can indulge in a sit-down dinner or luxury hot fork buffet from the talented in-house caterer, and truly wine and dine in style! And the party doesn’t stop there! Head onto the dancefloor with the Tale As Old As Time-esque backdrop surrounding you and experience a first dance and celebration like no other – surrounded by those you love. Weddings at QMUL is an exclusive use venue for a minimum of 100 guests. Situated in the heart of East London, it can be easily accessed by public transport. The venue is conveniently located between Stepney Green and Mile End stations. Weddings at QMUL have excellent facilities for bridal changing, exquisite in-house catering, and on-site parking. The venue offers totally bespoke packages so you can have your wedding your way! Limited ensuite bedrooms may be available on site. Otherwise, there are plenty of accommodation alternatives local to the venue. 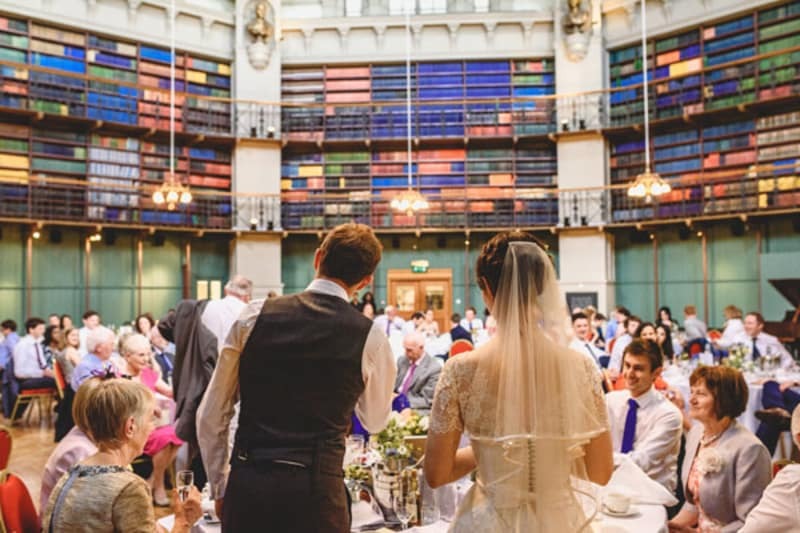 Weddings at QMUL can cater for up to 220 guests at your sit-down dinner in The Octagon. To hire the venue only, prices start at £5,000 and packages start from £72 per head. Fallen in love with this venue? We have! Head to their Bridebook profile and book a show-round today.